Behind every successful spirit is a great cocktail. Tequila has the Margarita, cachaca the Caipirinha, gin the Martini, and rum the Daiquiri. For rhum agricole, the cocktail that captures its essence and is essential to its success is the Ti-Punch. Ti is actually the Creole word for petit, or small, and helps define this drink more as a quick, small drink rather than a full 3-4 ounce cocktail. The Ti-Punch has its origins as a drink adapted on the island by Indian workers brought to the island of Martinique after the abolition of slavery. Originally the drink included tea, cinnamon, sugar, lime, and rhum agricole. The drink became popular on the island and was simplified by dropping the tea and cinnamon. The Ti-Punch shares the same structure as many other classic rum drinks (like the daiquiri and mojito), namely rum, sugar, and lime. What makes the Ti-Punch unique is that it is often adjusted to the taste of the individual drinker. 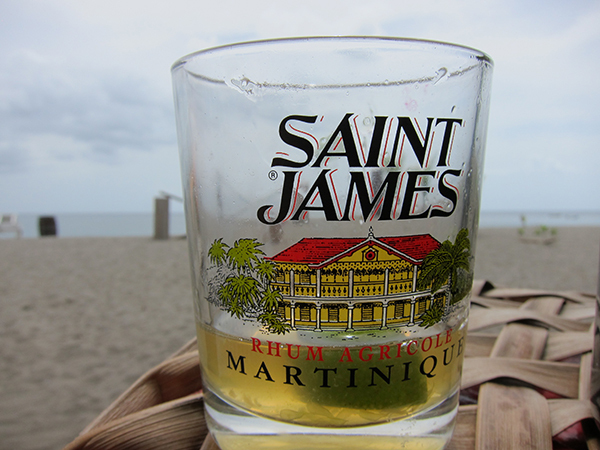 Ice is optional, but it helps soften the rhum, which is often 100 or 110 proof. Ti-Punch has so many subtle variations in its preparation, it’s hard to capture all of them. One of the key variations is the lime. Some serve the Ti-Punch with a lime disc, a cross section of the outer peel about the side of silver dollar with the smallest amount of the actual heart of the lime included. Others use actual slices of lime of varying size. There isn’t a right or wrong way to do it. Sugar is another element up for variation for the Ti-Punch. Traditionally either sugar or cane syrup is used, the amount depending on how sweet the imbiber wants the drink to be. Alternatively, crystallized cane sugar or sugar in the raw is used. The only real constant point in the preparation is that the sugar and lime are added first and given a chance to combine before the rhum is added. The amount of rhum added as well as the type again vary (including various proof white and aged rhums) depending on imbiber. Ti-Punch is considered a small sipping drink, not really even quite a cocktail, and most Ti-Punches have less than two ounces of alcohol in them. After the rhum is added, the Ti-Punch is then swizzled with a swizzle stick, called a lele. Swizzling a Ti-Punch both mixes the rum, sugar, and lime together as well as aerates the drink, making it even more aromatic. The Ti-Punch is an ideal way to begin the exploration of rhum agricole. It’s a perfect drink when you want a little something, and a nice alternative to doing a shot or getting a full cocktail.